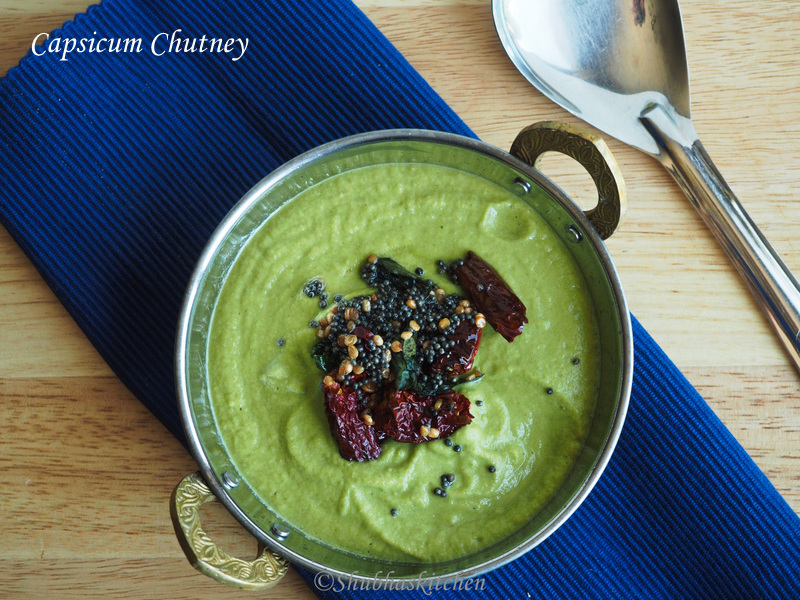 Capsicum chutney is a delicious chutney that pairs well with any dosa , uttapam or idli. 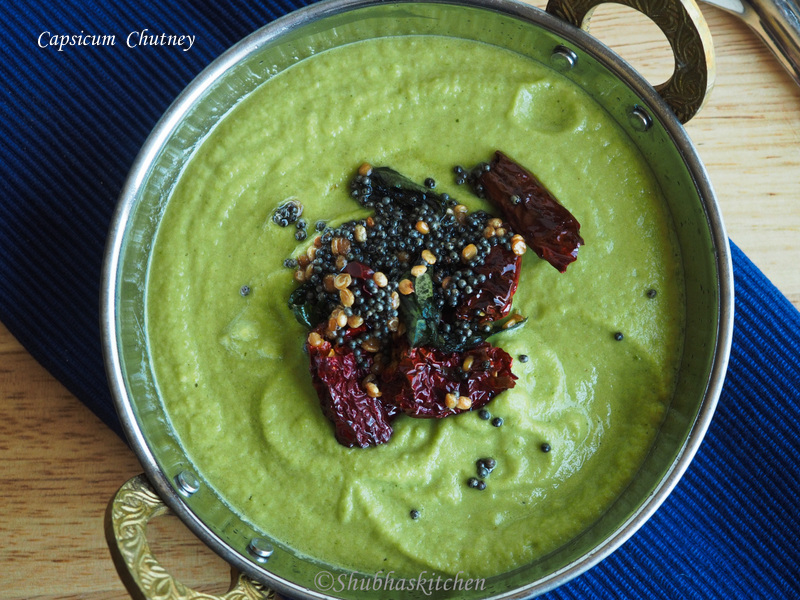 This is a wonderful alternative to the traditional coconut chutney. I make these type of alternative chutneys when I am short on coconut or just as a pleasant change from the usual coconut chutney. Heat 2 tsp oil in a pan. When hot, add the onion, ginger , green chillies and cilantro. Saute until onion is translucent. Add the chopped capsicum / bell pepper. Sprinkle some salt and let it cook until bell pepper is soft. Turn off the heat. Dry roast the dry coconut. Now grind, the bell pepper mixture, dry coconut and tamarind pulp using a little water. Adjust the salt (remember, we had added a little salt while cooking the bell peppers). To prepare the tempering, heat 2 tsp oil.When hot, add the mustard seeds, urad dal and dry red chillies. When the seeds start to crackle, add the curry leaves. Turn off the heat and add the tempering to the chutney. Very pretty green. I never had a bell pepper chutney. Loos so delicious! Will try this when I make idlis. How absolutely clever! And I suppose one can reduce the green chillies and use more capsicum for a milder version? I love this, will have to make it soon! Yes, you can very well reduce the number of chillies..flavor is still awesome..do give it a try!! I simply love adore any kind of chutney. 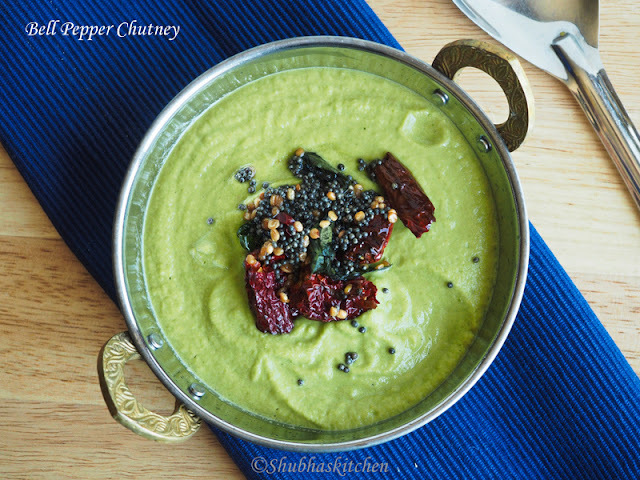 This bell pepper chutney is going on my waiting list to be tried soon. Crazily tempting. Looks so inviting shubha...I also make with red capsicum...it's also too good!! Loved your version too! !